Aroma Home Luxurious Eye Mask in Black blocks out light to enhance the quality of your rest or sleep helping you get that much needed rest at home or while travelling. The eye mask is filled with lavender seeds to soothe and help relaxation. 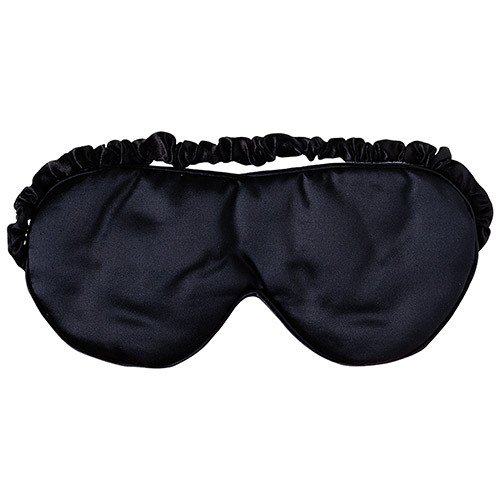 The front of the eye mask is made with an elegant, silky, soft satin. The reverse is made with a soft velour for extra eye comfort. The adjustable elastic strap ensures a secure and comfortable fit. A perfect gift for the stylish plane-hopper, these eye masks are also available in black, purple, blue and pink so you`re bound to find the one that`s just right for you or as a special gift for your friends and family. Only clean with a damp sponge, do not immerse in water. Avoid keeping in direct sunlight as eye mask and lavender fragrance may fade. Below are reviews of Aroma Home Luxurious Eye Mask - Lavender Seeds - Black by bodykind customers. If you have tried this product we'd love to hear what you think so please leave a review. I have been using these masks for approximately ten years now and find them comfortable and luxurious. On this occasion for the first time I found the band that goes round the head area a touch tight and I only have a small head but this is most likely a one off as I've never had this before.